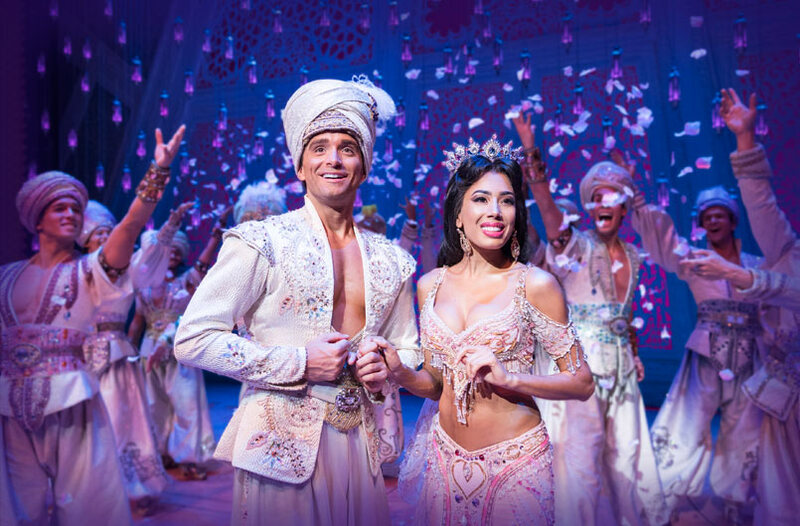 How long have you been waiting for Disney's Aladdin to come to the West End? 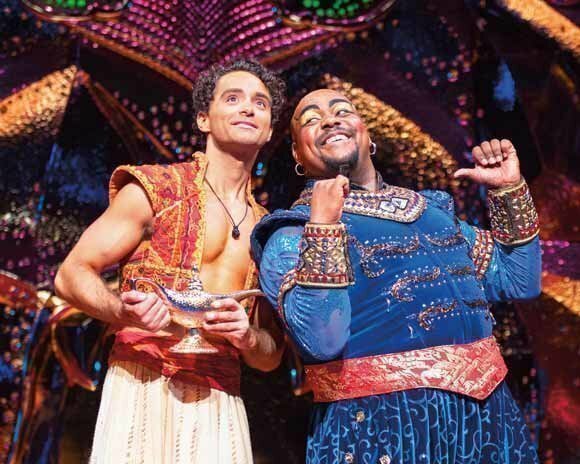 It's been making waves over the water on Broadway since 2014 and now it's due in Britain, fresh for a UK début in summer 2016 at the Prince Edward theatre. 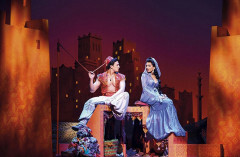 Aladdin the movie gave birth to one of the most popular love songs of all time, A Whole New World. It has been played at a million weddings, covered in karaoke bars all over the planet, whistled in the streets by workmen and sung by gangs of brides-to-be on thousands of hen nights. The song is 23 years old and as well-loved as ever. Imagine the treat, seeing it sung live on stage in all its glory, set like a star amongst a host of legendary show tunes from Alan Menken, Howard Ashman and Tim Rice. Fabulous. There's a brand new book by Chad Beguelin of The Wedding Singer fame. The production includes three songs written for the film by Howard Ashman but not used, plus four new songs written by Menken and Beguelin, all bringing plenty of extra spice to the original well-loved score. The costumes have to be seen to be believed, brilliantly creative. And the stage sets are reminiscent of old-school Astaire and Rogers TV musicals: magnificent, exotic, vivid and splendidly lit. 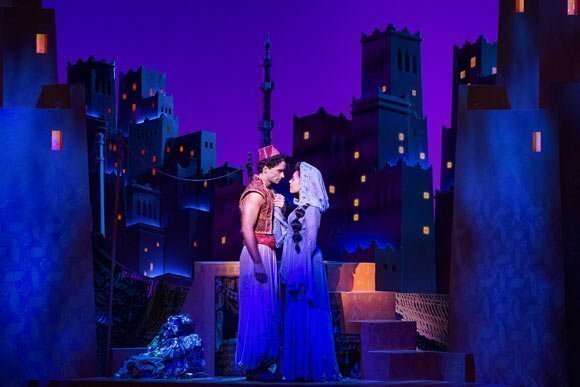 When the young street urchin Aladdin falls head over heels with the beautiful Princess Jasmine, he has no chance of making his dreams come true. What princess, after all, marries a mere pauper? 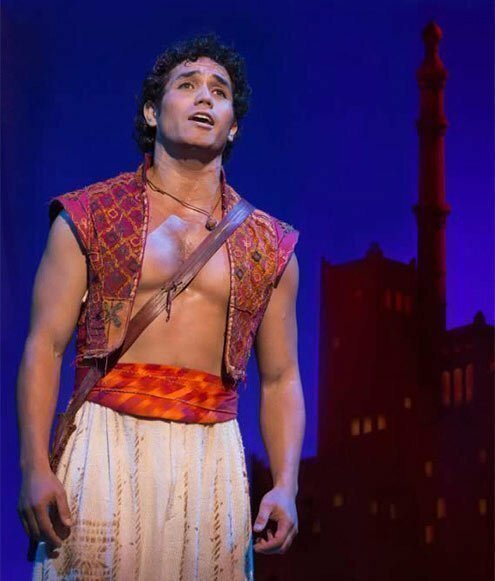 But Aladdin has a secret weapon in the shape of a magic lamp, complete with an equally magical genie to help make the boy's wishes come true. And he has a very special friend, the loyal monkey Abu. 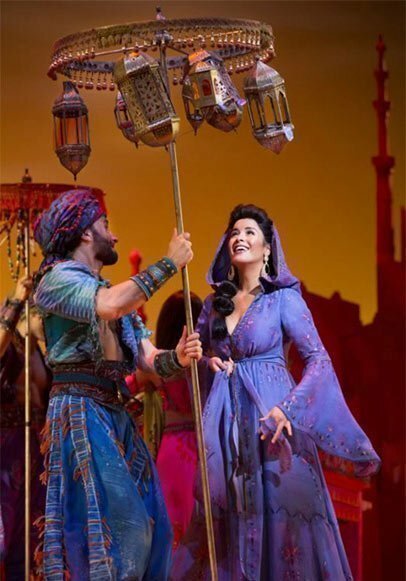 A host of thrilling adventures ensue until, no thanks to the evil Grand Vizier Jafar, Jasmine ultimately falls in love with Aladdin and things finally work out. We'd hate to spoil the plot so we won't say any more. Suffice to say it's perfect for children of every age, loved just as much by adults for the sheer nostalgia and wonderful memories. If you've been dying to hear songs like One Jump Ahead, Proud of Your Boy, These Palace Walls, A Million Miles Away, Diamond in the Rough and Friend Like Me, now's your chance. We predict a fast run on tickets for this long-awaited transfer, so book early. 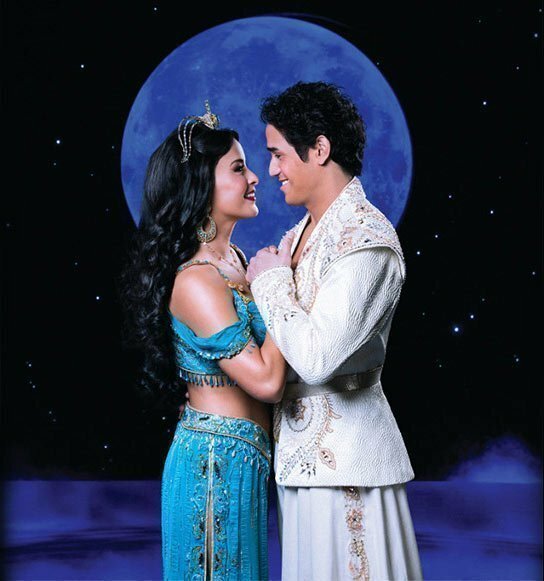 Want Aladdin tickets? We always have great availability and you'll enjoy excellent value for money on the complete range of ticket types and seats, cheap to posh. Spectacular! Not to be missed! 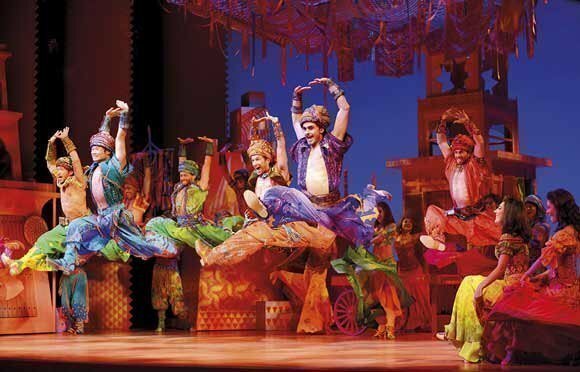 A fabulous musical stage production, with the most amazing set designs, costumes and choreography. Enchanting and entertaining- I commend the cast, the band and all those involved behind the scenes for a magical matinee! 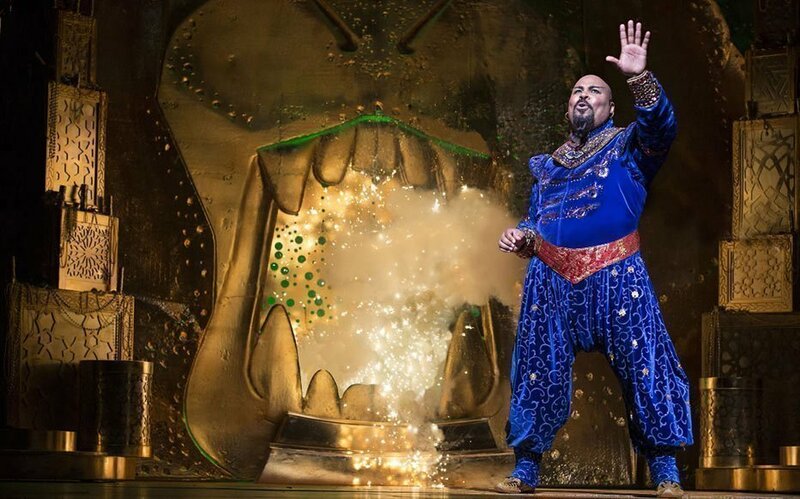 The plot is simple, the characters 1-dimensional and reminded me of a panto but the performances were great and the sets, costumes, effects and choreography were outstanding. Overall very good ! 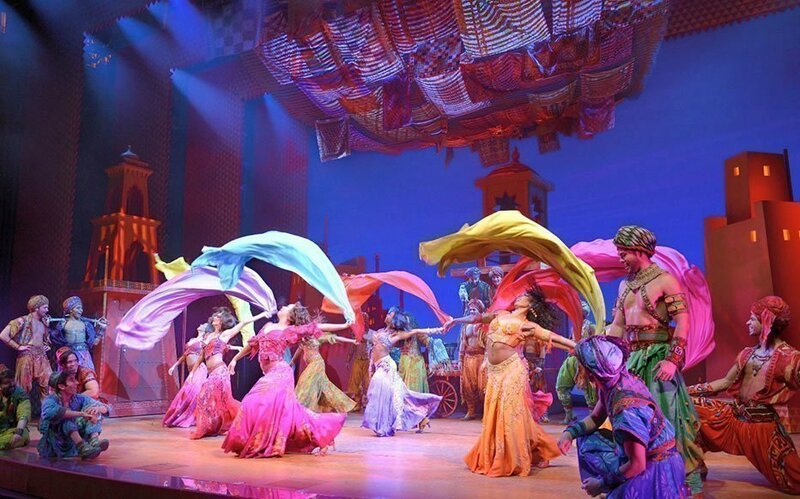 Fabulous costumes & set decoration very colourful & creative ! The Magic carpet scene on the starry night was total magic! Acting was a little pantomime though. Jasmine had little stage time, not that impressive. 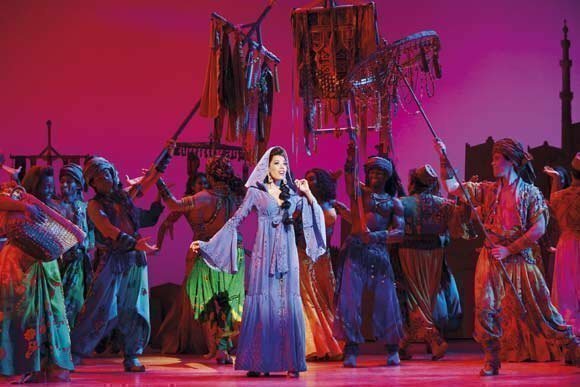 Genie was Fabulous! 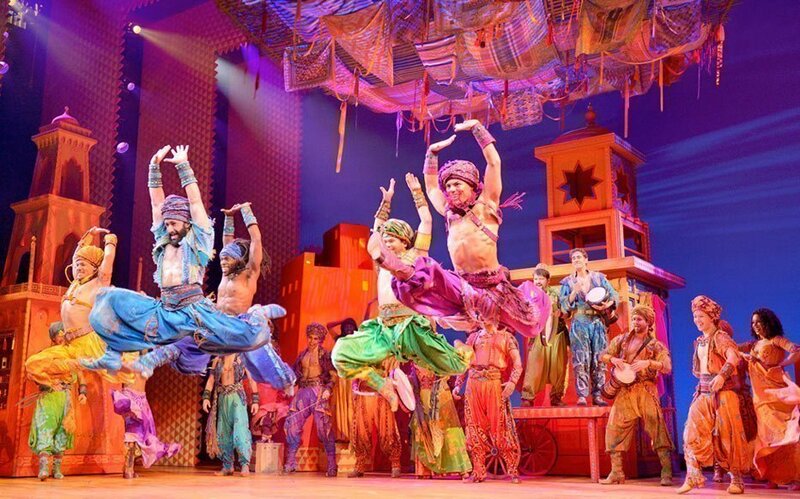 Aladdin was fantastic, great performance all the way! The costumes were breathtaking, and we had the best seats in the front row! I’d definitely recommend this show, won’t be disappointed! Thanks for the great night! This show was bright and colourful, full of energy from cast members. It is a great show for everyone to see. Highly recommend.. 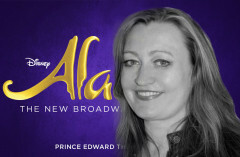 Went to see Aladdin Saturday night in Prince Edward theatre. Granted seat prices are ‘saucy’ but our family really enjoyed the experience. Show and set were amazing. Best props and staging I’ve ever witnessed. 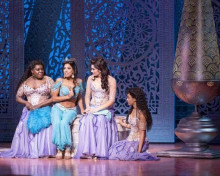 I wondered how could they possibly make a magic carpet ride for ‘A Whole New World’ but my did they pull it off!!! More than a Panto, but only just! 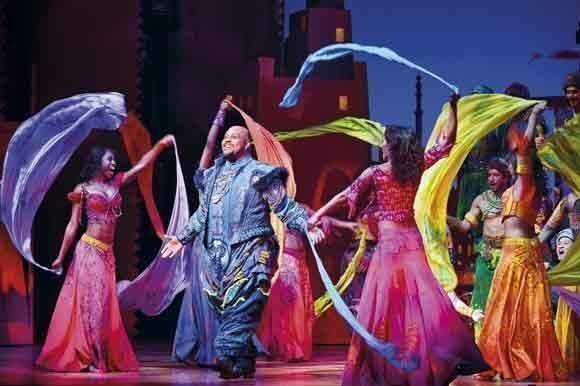 A great family show with some well loved songs, the whole thing is brought together by the Genie who is the true star performer. 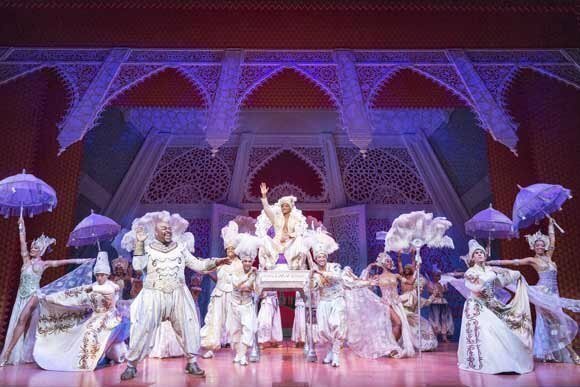 The carpet ride was clever, however as a whole it didn't rise far enough above Christmas Panto look and feel to make it worth the experience of a return visit. Fabulous! Really exceeded my imagination... And I have seen a lot în my life. Loved every minute. Even my husband- a theatre virgin- loved it! Magical, still can’t workout how they did the flying carpet. Having recently seen the Lion King in theatre and finding it to be absolutely incredible, I will say that I am once again impressed with the magic of theatre. The actors from the front liners to the backup dancers were nothing short of amazing. Everyone involved seemed very passionate about what they do. They have not only influenced me to encourage my family and friends to attend this show but to attend more theatre in general. Thank you for such an amazing experience, it was a perfect birthday gift for my girlfriend. Excellent Production - definitely recommend to see in London. Great for all ages! 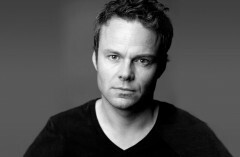 Happy, Cheerfull and great acting!! all the hits, was funny too! We loved everything about the show. 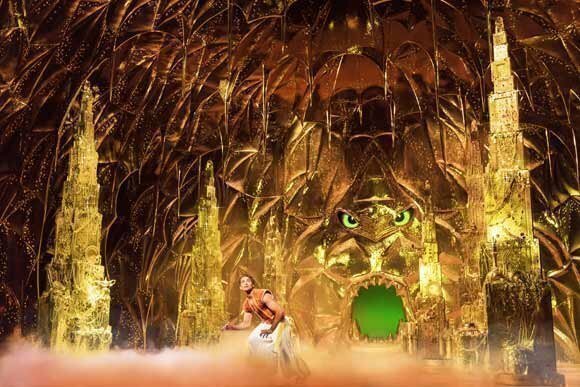 The actors, the dancers, and the stage setting was phenomenal! Best show of my life. Amazing! The show was amazing. The acting, the music and costumes, the lights and effects were brilliant. 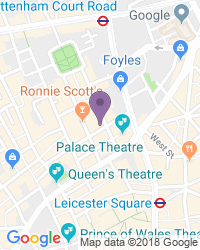 We went to the 14.30 show and there were many small children and was a bit noisy, so if you want to avoid that it would be better to go to the evening show. A must see show. AMAZING!!! It was a very good show. Genie was absolutely marvelous. 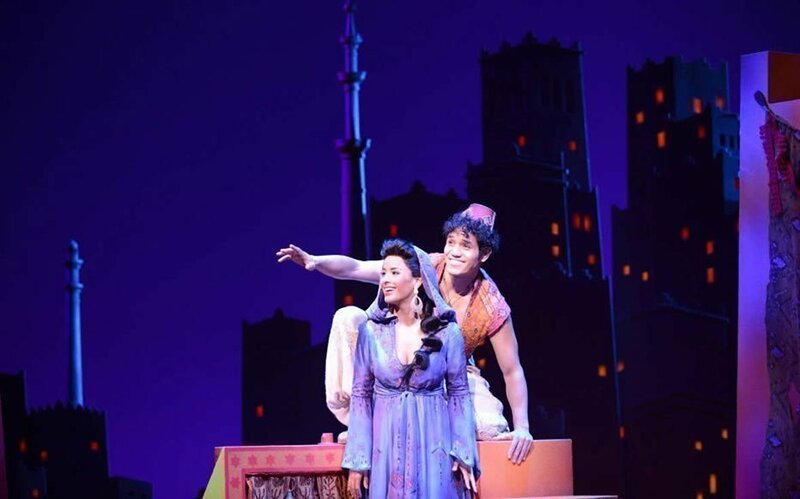 A very good show, with the right amount of humour and very good songs and acting, great costumes and scenery. Just such a shame that the tiger's head did not come apart properly which meant people had to go onto the stage and the rest of the scenery was delayed. No apology was given either and no refund offered, treated very poorly. A big disappointment. Very magical show with good fun. But sometimes the scene was shorted or two quick on the action when they probably needed more time and tact to be done. Costumes are amazing. Wonderful voice and dance! Amazing show, amazing seats, everything was great. The show itself was absolutely wonderful and the Prince Edward Theatre is a lovely setting for it. Pity about the general stampede out of the theatre once the curtain was barely down. It’s very funny and coloured. What an amazing show! The cast was awesome however the genie and aladdin and jaffar stole the show! A must watch by all. Any age group can watch this. Just epic! I took my wife for her birthday and we loved every minute. Great music, songs and acting. The stage back-lighting for the magic carpet ride was excellent and as for the magic carpet...”how did they do that”! All of the actors were great and really brought the magic of Disney alive. 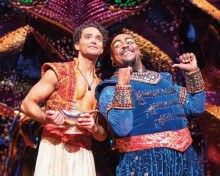 We must give a special mention to Trevor Nicholas as the Genie. I didn’t think anyone could replace the iconic Robin Williams but Trevor did a fantastic job. It was a real highlight for us both and will last long in the memory. Thanks to the whole team for putting together this fantastic production and making our night so special. I defy anyone to not like this show...it is a must see! GTS, Nottingham. Completely absorbed in the performance. 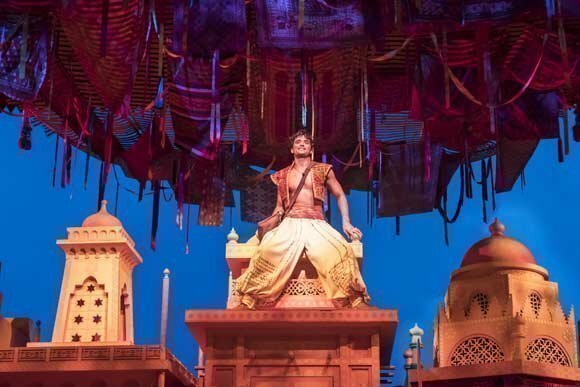 The colours, the stage decorations, pyrotec …..I was taken away to the land of Agraba !!! Fantastic cast, costumes and stage scenery brilliant. 10 year old loved it. 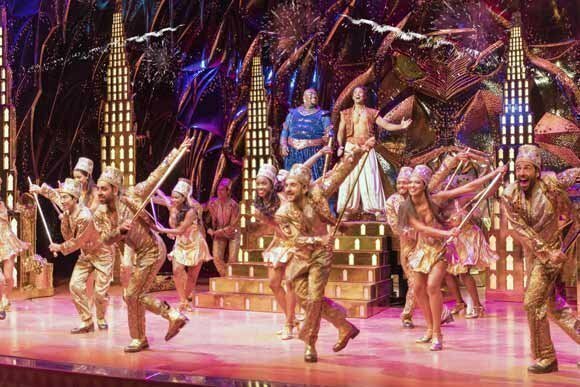 It was a magical spectacle with amazing scenes, special effects that took your breathe away complimented great dancing and singing. 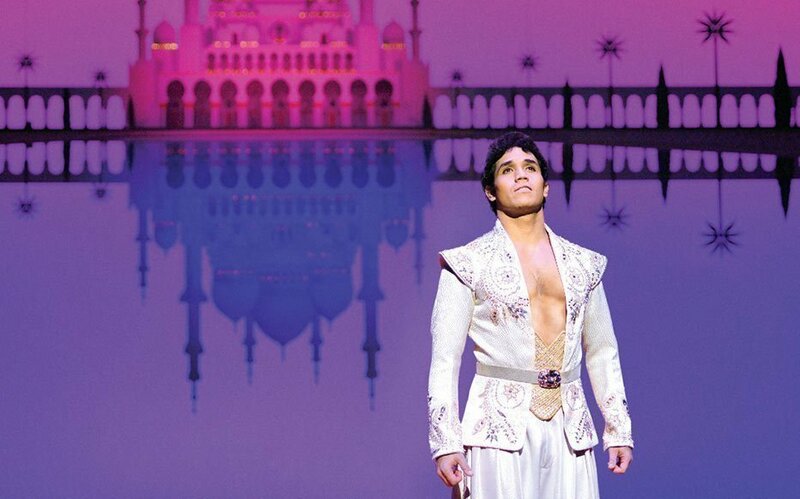 Special effects amazing, costumes fabulous & music spectacular. I would go see this show again. A-Mazing!!!! I loved this more thank lion king it was just fabulous rein start to finish. The set and cast were amazing. Choreography was brilliant music insane and just so funny too. LOVED it. My 6year olds birthday and she LOVED it! 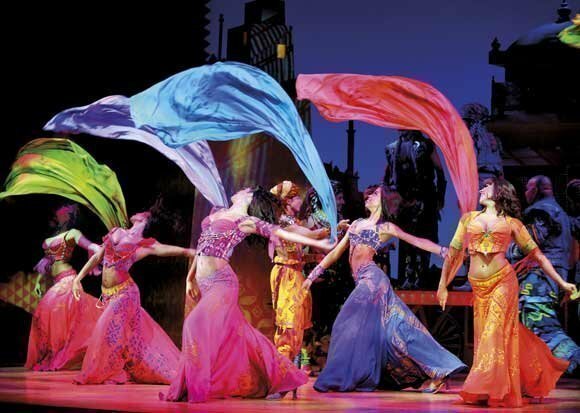 The costumes and sets were mind-blowing and the singing and dancing was very good as well. However, the dialogue was filled with corny jokes that relied on tired stereotypes that weren’t that funny and lacked intelligence. Fantastic colorful spectacular show !!! It was the best and most entertaining show I’ve see in a long while. Full of amazing costumes, dance routines and singing. A great evening ! The Genie is fabulous !!!!! We don’t know how this show is still running. Very poor quality and weak story. Wonderful production. Excellent singers and very entertaining and funny characters. Enthralling from start to finish. My 3 kids (5, 8 & 11) all loved it! The show was brilliant, from the lighting to the acting to the music. Even though our seats were a little far off, we still enjoyed the show. being closer would have been better, as we would have been able to see the characters closer up. I do feel the tickets for such a long running show could be a little cheaper, making it possible for everyone to sit closer up at some point. However, overall a fantastic experience! Great set, great cast, great show! Go and see - you won't be disappointed! The singing, dancing and acting were fab, as were the costumes and scenery. The special effects really cool. Everyone will enjoy this show! Beautiful ! Lively ! Funny ! I have been to numerous musicals in my life and this was definitely one of the best. I don’t normally write reviews but I feel very strongly about this one! Totally recommend and if you buy last minute tickets are cheaper. Good for grown ups, kids, families, first dates-really fun and enjoyable. The genie makes it happen, genie is the brains behind it all, he is so funny and just makes it so lively! An amazing show with amazing actors. Special shoutout to Genie! Great lights and costumes. Everything was so colourful! 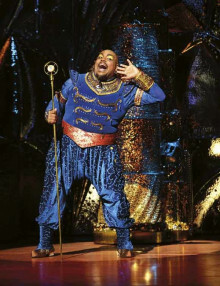 Genie was an amazing actor and absolutely funny. However, it was not the best story line. Songs, which were not my personal favourite, seemed to be a little longer than the ones I did like and enjoy. Also, had great seats but ended up with an annoying couple sitting in front who were too cozy, blocking my entire view of the second half. Otherwise, it was a good experience. Fantastic,,, really great to see this show full of excitement. 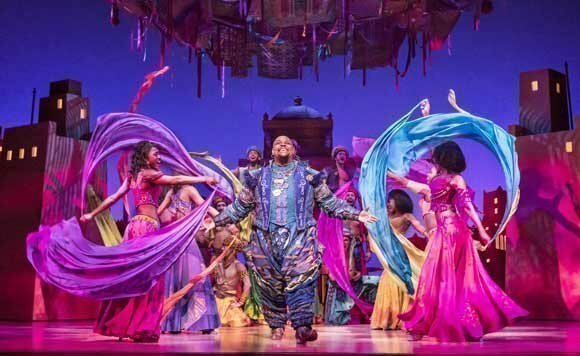 Brilliant show and well performed, staff helpful and definitely would recommend to anyone who loves Aladdin especially me growing up as a kid! Credit to everyone working towards this show! 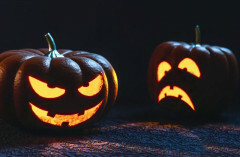 With Halloween fast approaching there’s plenty of opportunities to enjoy a spine tingling night in the West End. 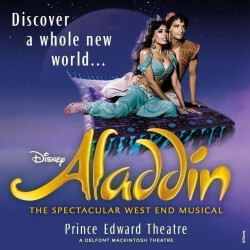 How can I sum up Aladdin at the Prince Edward Theatre in one word? 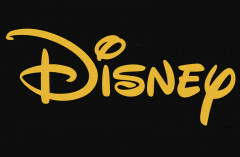 What Next for the Disney Musical? 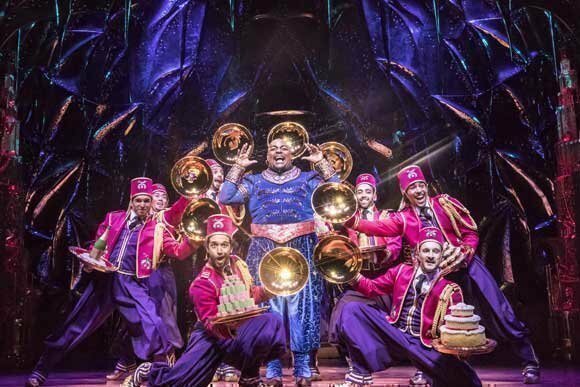 Flying carpets will be swapped for flying nannies at the Prince Edward Theatre next year when the long-running blockbuster musical ALADDIN with be replaced by the return of the long-running blockbuster musical MARY POPPINS. 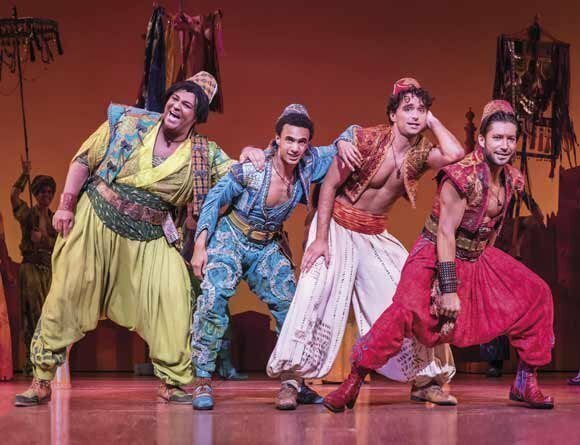 Disney Theatrical Productions announced have just announced who is to play the leads in the West End premiere of the new musical based on the classic Academy Award®-winning animated film, Aladdin. The eagerly awaited big budget Broadway show will open at the Prince Edward Theatre on Wednesday 15 June 2016, with previews from Friday 27 May. Don’t get too excited, it’s no one you’ve ever heard of, mostly ex members of THE LION KING and BEND IT LIKE BECHAM casts although no doubt they’re excellent performers. The big news is that Broadway cast member Trevor Dion Nicholas will make his London stage debut as Genie. 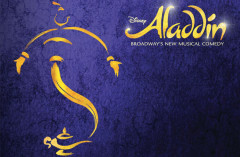 Use the search box at the top left of this page to search for Aladdin The Musical tickets availability.